Rule the Rail Game - Download and Play Free Version! 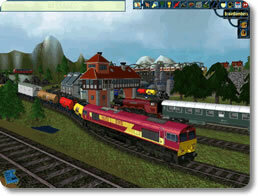 Put Together Fantastic Trains and Railroads in this Digital Model Builder! Have you ever had an interest in putting your own model trains together, running elaborate tracks throughout your house and home, or assembling miniature worlds complete with fully operational railroads? Have you ever delved into the hobby in your youth and wish you could get back into it? Assembling train models can be a lot of fun, but it’s also very expensive and can eat up a lot of physical space. Fortunately, Rule the Rail sidesteps all those issues by acting as the first train-building set you can get on your very own computer! No train set is complete without the actual train of course! Assemble an elaborate train that looks the way you want it to look, that is as long as you need it to be, and holds the goods you want it to transport. Power your trains using over a dozen engines, including modern day models to the antiquated steam locomotive. Trail over 25 wagon types, each designed to transport different goods, including oil, coal and acid. Includes over 9 carriages, each with its own distinct appearance. Having a train is all fine and dandy, but if you want it to do more than sit around looking pretty, it will need tracks to run on. Rule the Rail doesn’t stint in this department, giving you all the options you need to build a realistic railway system. Better yet, you can literally rule the rail by operating it directly once it’s all finished. Lay tracks down on the landscape. Wind them all around the map and branch them out to your heart’s content. Set up forks, gates and crossings. Cut through the earth by building tunnels through it. 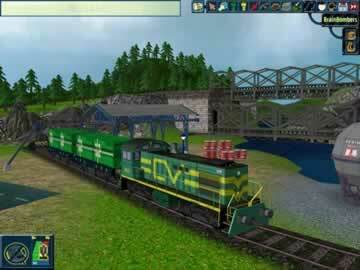 Control the traffic of your trains. Reverse their directions, open and close forks in the tracks, change destinations or create new ones, and more! Rule the Rail gives you the tools needed to make your very own digital diorama for your train to inhabit. Use your imagination to create a living and breathing world! Mold the very terrain itself into the shape you want. Form mountain, plateaus, hills, fields and lakes. Edit the details of your land. Set up grassy knolls, rocky outcrops or entire forests! Build villages, towns and cities using a wide variety of buildings, including houses, stores, garages, refineries, saw mills, office buildings and more! Populate your world by placing models depicting a wide variety of people in it. Give it a further lived-in feel by adding props like cars, lamps and benches! Rule the Rail provides in-depth tools to build a fully functional train model on your computer. If you long to get into the train-building hobby, then consider ruling the rail today!